Новости | Federal centre for collective use<br>"State engineering centre" of MSTU "STANKIN"
On February 22, 2019, SEC of MSTU “STANKIN” signed a cooperation agreement with the chamber of Commerce and industry of the Russian Federation. The main purpose of cooperation is to promote educational, research and engineering activities in the field of high–tech engineering and machine tool industry. 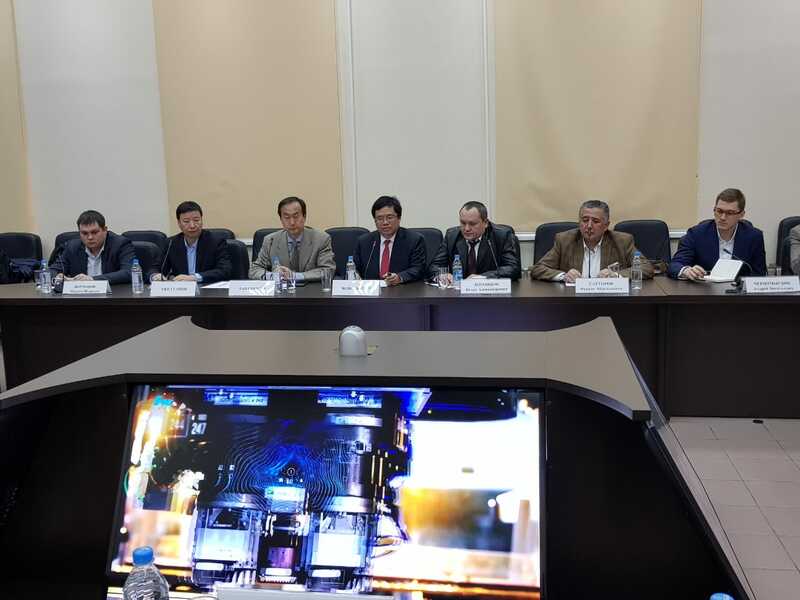 On February 21, 2019, the leadership of SEC MSTU STANKIN held a working meeting with the delegation of Huazhong State Technological University (China) with the participation of representatives of the Ministry of industry and trade of Russia. The main topic of the discussion was interuniversity cooperation in science and technology. The employees of SEC of MSTU "STANKIN" gave an interview to JSON.TV. Representatives of JSON.TV got acquainted with the capabilities of SEC of MSTU "STANKIN" in the field of additive technologies and interviewed the staff of the Laboratory of Innovative Additive Technologies and the technological ground. Representatives of the French delegation of 20 people visited SEC of MSTU "STANKIN"
From 23 to 27 October 2018, the French-Russian strategic session “Technologies of additive manufacturing” was held in Moscow, where representatives of companies working in the field of additive technologies from Russia and France gathered for a dialogue. The session was organized by the Center of Scientific and Technological Cooperation NaukaInnov of the French-Russian Chamber of Commerce and Industry CCIFranceRussie. Read more about Representatives of the French delegation of 20 people visited SEC of MSTU "STANKIN"
On July 25, the opening of the season of scientific and educational activities for students in the framework of the project of the Department of education of Moscow «University Saturdays» was held at MSTU «STANKIN». SEC of MSTU «Stankin» took part in International industrial exhibition «INNOPROM» (Yekaterinburg). SEC of MSTU "STANKIN" held an International school of young scientists and specialists within the framework of the exhibition "Metalloobrabotka-2018"
On May 16th, within the framework of the 19th annual exhibition "Metalloobrabotka-2018", a session of the International school of young scientists and specialists in the field of digital production was held. The event was supported by the directorate of “Expocentre” and the Russian association "Stankoinstrument". Read more about SEC of MSTU "STANKIN" held an International school of young scientists and specialists within the framework of the exhibition "Metalloobrabotka-2018"
The finalists of the all-Russian student competition "Best innovative project in the field of metalworking-2018" are determined"
SEC of MSTU “STANKIN” and JSC “EXPOCENTRE” are pleased to announce that on April 25th, 2018, the acceptance applications for the all-Russian student competition Best innovative project in the field of metalworking-2018" was completed. Within the framework of the opening ceremony of the forum "Digital engineering production: problems and solutions", organized by SEC of MSTU “STANKIN” of the all-Russian competition among the students "Best innovative project in the field of metalworking-2018" were awarded. Read more about The finalists of the all-Russian student competition "Best innovative project in the field of metalworking-2018" are determined"
Agreement on the establishment of a joint department of SEC of MSTU "STANKIN "and JSC "Baltiyskaya Promishlennaya Kompaniya"
On 14th of May, in the territory of the Expocentre Fairgrounds within the framework of the business program of the exhibition Metalloobrabotka - 2018, the rector of MSTU “STANKIN” Elena Kataeva and the general director of JSC "Baltiyskaya Promishlennaya Kompaniya" Diana Kaledina signed an agreement on the establishment of a joint department on the basis of the university. Read more about Agreement on the establishment of a joint department of SEC of MSTU "STANKIN "and JSC "Baltiyskaya Promishlennaya Kompaniya"
SEC of MSTU "STANKIN" announced the all-Russian competition among the students "Best innovative project in the field of metalworking-2018». The competition is held with the support of the joint-stock company "Expocentre", is timed to the international exhibition "Metalloobrabotka-2018" and will be held from 26th of March to 18th of May 2018.